Maintaining your swimming pool with the correct levels of sanitiser is vital. This is why 1st Direct Pools have spent time researching and stocking only the very best premium swimming pool Chlorine, Bromine & alternative pool Sanitisers for you to choose from. There are several ways of sanitising your pool. You have the choice of Stabilised Chlorine Granules, Chlorine Tablets (Large 200g and Small 20g), Bromine Tablets, Multi-functional Tablets and Granular Shock. For advice phone our technical hotline! Sanitising your pool is an important part of maintenance. Sanitisers kill the bacteria that like the water environment that a pool provides. 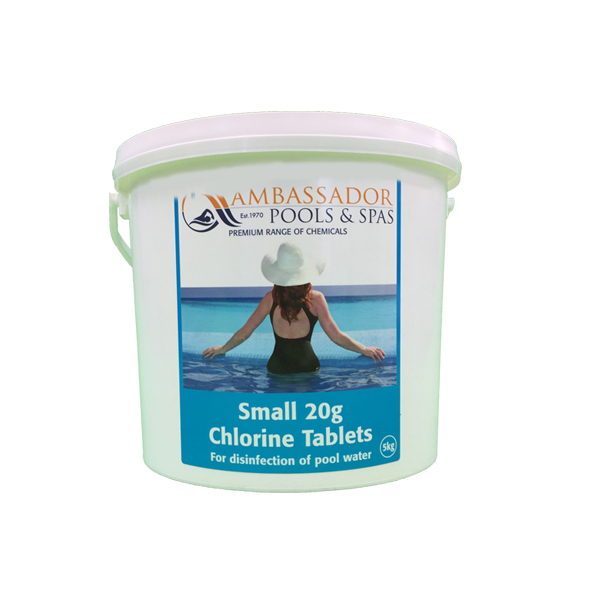 Our product range of Chlorine, Bromine & Sanitisers include: - Chlorine and Bromine in either Granular or Tablet form, Shock and Non-Chlorine with clear dosage instructions to help keep your swimming pool safe. The correct levels of chemicals should also help increase the longevity of your pool equipment and give you a more enjoyable experience. As with any chemical, they should be stored somewhere dry, out of direct sunlight and definitely out of the reach of children. In addition, you should keep your chemicals separate and never mix them as you may cause an adverse reaction. If you need more information on which Chlorine, Bromine & Sanitisers to use. Please call our Technical Help Desk on 0333 900 40 40.